Shah Rukh Khan is currently in Europe to shoot for Imtiaz Ali’s tentatively titled, The Ring, along with Anushka Sharma. Well, when it’s Imtiaz’s film, one can expect some exotic locations. And when the film is of travel genre, then it’s definitely going to be a treat to watch. The team has shot in three different cities by now, Prague, Amsterdam, and Lisbon. SRK’s last locale was Lisbon and now he has moved to a new place where he is feeling really cold. Well, the Dilwale actor himself shared that he is feeling cold at this new place he is shooting at. The team is now at Budapest to shoot for their fourth schedule outside. But looks like King Khan is unable to bear the cool weather there. Hence, he took to his Twitter to share how he feels. In the tweet pic, he is sitting on a sofa wearing a t-shirt and a zipper on it. He is also sporting cool dark shades. But, still, he is feeling cold in the weather. Also, he looks too good in the stubble look. In the film, Shah Rukh plays a Punjabi tour guide. Anushka plays his love interest; a Gujarati girl in the film. The Ring is supposedly releasing next year during the Independence day week. 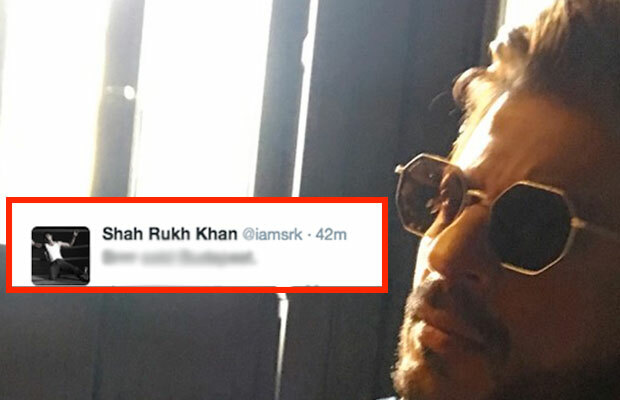 Apart from this, according to reports, the trailer of Raees will be out on SRK’s birthday, i.e. on November 2. Last year, he released FAN’s trailer on his birthday and he is again using the same strategy; well, his fans will have a good time for sure. Raees will be releasing next year on January 26, 2017.